If you find difficulty in downloading songs from Apple Music, here are all the guides and tutorials you may need to get it over. Below are some useful tips on how to easily remove DRM from Apple Music and convert Apple songs to DRM-free MP3/AAC/FLAC/WAV format. Is it possible to listen to Apple Music on Samsung Galaxy S10? Dont' worry, you can refer to this tutorial to learn how to play Apple Music on Samsung Galaxy S10 in two different ways. Do you want to save your Apple Music to your iPhone X? This article will introduce a way to stream Apple Music to iPhone X by using Sidify Apple Music Converter. Following the steps, you can get unlimited Apple Music files easily. Are you looking for a way to save Apple Music to your Mac? This article will tell you how to convert Apple Music to Mac step by step. How to transfer Apple Music to Samsung Galaxy S9? This article will introduce a solution to convert Apple Music to Galaxy S9 in detail. Looking to find a way to play Apple Music on Raspberry PI? In this guide, we will walk you through the solution to stream Apple Music to Raspberry Pi step by step. Is it possible to get Apple Music on Apple TV? This article will solve the issue on how to play Apple Music on Apple TV in two solutions. Is it possible to play Apple Music songs on Linux? Linux doesn't support Apple Music app. But you can convert Apple Music songs to the common audio files to transfer them to Linux with Sidify Apple Music Converter. How can I get Apple Music on Windows Phone? With Sidify Apple Music Converter, you can convert Apple Music songs to Windows smartphones supported audio formats so that you can transfer them to Windows Phone in two ways. Is Apple Music worth your money? Here are some pros and cons of Apple Music for you to figure out whether to subcribe Apple Music streaming service or not. Squeezebox is a network music player from Logitech. In this article, you can learn how to remove DRM and convert Apple Music songs to MP3 so that you can play them on Squeezebox with Sidify Apple Music Converter. How to put Apple Music songs on Huawei Mate 20? With Sidify Apple Music Converter, you can easily convert Apple Music to Huawei Mate 20 supported audio formats for playback. If you have some trouble connecting your Apple devices with your Bose SoundTouch, this article which provides some useful methods will help you play Apple Music songs on SoundTouch Speaker. Looking for ways to play the Apple music songs in your car? This article offers several effective ways to help you enjoy Apple Music tracks in your car. Currently, Apple Music is not available for Amazon Fire TV devices. Here Sidify Apple Music Converter can help you to remove DRM from Apple Music and convert them to MP3 so that you can upload DRM-free Apple Music to Amazon Music for playback. Is it possible to mix Apple Music songs in Virtual DJ? With Sidify Apple Music Converter, you can easily import Apple Music tracks to Virtual DJ for playback. OnePlus 6T released on October, 2018, features a 6.41-inch AMOLED Display, a napdragon 845 chipset, 3700 mAh battery, 16+20 MP Dual camera and up to 8GB RAM. This article aims to tell you how to transfer Apple Music songs from iTunes to OnePlus 6T for Windows users. How can I get Apple Music songs on Samsung Galaxy tab s4? This article will provide the simple guide on how to remove DRM and convert Apple Music to common MP3 for playback on Samsung Galaxy Tab S4. Any way to stream apple music on ps4? There is no Apple Music app on PS4. But don't worry, you can transfer Apple Music to PS4 via USB for playback by using Sidify Apple Music Converter. How can I get Apple Music on Google Pixel 3? Sidify Apple Music Converter can help you to remove DRM from Apple Music tracks by converting them to unprotected MP3 so that you can transfer them to Google Pixel 3 directly. How do I upload music from iTunes Apple Music to my Dropbox? This tutorial provides a detailed guide to tell you how to remove DRM and convert Apple Music so that you can upload Apple Music files to Dropbox easily. Can I stream Apple Music to Roku? Apple Music is not the default streaming channels of Roku. In this article, we will show you a simple way to enjoy Apple Music on Roku with Sidify Apple Music Converter. Does Apple Music work on Kindle Fire Tablet? This article will show you how to remove DRM and convert Apple Music to MP3 with Sidify Apple Music Converter so that you can transfer Apple Music to Fire Tablet for playback. Is it possible to play Apple Music on Plex? Sidify Apple Music is able to remove DRM and convert Apple Music to common MP3 so that you can play Apple Music with Plex Player. How to play Apple Music through Web Player? This article would show you two approaches to help you listen to Apple Music on web player at will. Apple Music and Google Play Music are two popular music streaming services. This article mainly focuses on how to move Apple Music songs to Google Play Music with Sidify Apple Music Converter. Is there any way to get Apple Music to sync to Nuvo player music port? You've come to the right place! Sidify Apple Music Converter can help you to remove DRM and convert Apple Music plain MP3 format for playing on Nuvo Player. With Sidify Apple Music Converter, you can remove DRM from Apple Music and conver to the common audio, so that you can upload converted Apple Music to Google Drive. How can I listen to Apple Music on my computer without iTunes? With Sidify Apple Music Converter, you can remove DRM from Apple Music songs and convert them to unprotected audio for playing on your computer. Due to DRM, we can't listen to Apple Music with VLC Media Player. Don't worry, we will provide an easy way to help you play Apple Music on VLC Media Player. If only we could save Apple Music on the external hard drive! Don't worry, this tutorial will help you to move your favorite songs from Apple Music to the external hard drive easily. It is difficult to transfer Apple Music to Windows Media Player because of DRM. In this article, we will provide a simple solution to help you play Apple Music on Windows Media Player. With Sidify Apple Music Converter, you can remove DRM from Apple Music files and convert them to unprotected MP3, AAC, WAV or FLAC so that you can play Apple Music on the new Galaxy Note 9 easily. Can you use Apple Music on an iPod Shuffle? In this article, you can learn how to remove DRM from Apple Music and convert them to common audio format so that you can play Apple Music on iPod Shuffle easily. How to enjoy Apple Music on your Android phone or tablets? This article will introduce the best Apple Music Converter to help you convert Apple Music to MP3 for playing on various devices. What is the difference between Apple Music and iTunes Match? Which is the best best Apple Music service to use? Is it possible to play Apple Music on Kodi Media Player? Sidify Apple Music Convert can help you to remove DRM from Apple Music and convert it to Kodi supported format for playback. Can you play Apple Music on Google Home? This article will help you to enjoy your Apple Music freely on Google Home in two ways. How to keep Apple Music after subscription ends? With this tutorial, you can convert Apple Music to common audio format so that you can keep Apple Music forever after cancelling subscription. Apple Music cannot be used on the iPod Nano. With Sidify Apple Music Converter, you can remove DRM and Convert Apple Music to common audio file so that you can play Apple Music on iPod Nano smoothly. How to remove DRM from Apple Music files? With sidify Apple Music Converter, you can legally remove DRM protection from Apple Music tracks and play them without any limits. Can you download Apple Music songs to computer? This article will help you to save Apple Music songs to computer completely by using Sidify Apple Music Converter. With Sidify Apple Music Converter, you can remove DRM from Apple Music and convert them to common audio format supported by Galaxy smartphones for playback. Do you want to set Apple Music as ringtones for your iPhone? Here is an easy guide to make Apple Music as Ringtone for iPhone by removing DRM from Apple Music with Sidify Apple Music Converter. Can you stream Apple Music to Chromecast? Don't worry, this tutorial will help you remove DRM protection from Apple Music and cast Apple Music to Chromecast Audio for playing. How to add Apple Music tracks to iMovie? In this article will offer the perfect solution which can remove DRM from Apple Music and convert them to unprotected audio for adding into iMovie. With Sidify Apple Music Converter, you can convert Apple Music to common audio like MP3 or AAC so that you can transfer Apple Music songs to Sony Walkman for playback easily. How can I put Apple Music on an iPod? With Sidify Apple Music Converter, you can play Apple Music on iPod Touch, iPod Shuffle and iPod Nano easily. How to listen to Apple Music on Chromebook? This article will show you the ultimate guide on how to convert Apple Music to the audio format supported by Chromebook. How to use Apple Music on Xbox One? In this article, we will show you how to play Apple Music on Xbox one as background music while playing games in two ways. Want to play the downloaded Apple Music via Amazon Echo? Don't worry, this article provides two simple solutions to stream Apple Music to Amazon Echo easily. How to transfer music from iTunes Apple Music to your USB? In this guide will provide a step-by-step tutorial help you to remove DRM and convert Apple Music to USB drive. 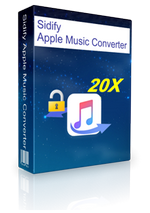 Sidify Apple Music Converter can convert Apple Music songs to common MP3 format. Follow the guide to convert Apple Music to MP3 so that you can play Apple Music files on MP3 player with ease. You might be searching for an excellent tool to remove DRM protection from iTunes M4P music. Sidify Apple Music Converter is a great tool to remove DRM from iTunes M4P music for syncing to Galaxy Note 8. Here you will find the best way to remove DRM from iTunes music with the most popular Apple Music DRM removal tool - Sidify Apple Music Converter. You can't convert Apple Music to FLAC diectly until you use Sidify Apple Music Converter to remove DRM from iTunes Apple Music by converting them to unprotected FLAC format. Have you ever been struggling to convert the downloaded Apple Music to WAV? Sidify Apple Music Converter allows you to convert Apple Music files to WAV without any hindrance. If you're wondering about how to convert Apple Music to AAC, you have come to the right place. This article will help you to remove DRM and convert Apple Music to unprotected AAC with Sidify Apple Music Converter. M4VGear is the best iTunes DRM Video Converter on Mac which is able to keep all of the audio tracks when removing DRM from iTunes M4V videos.